Atlantis can convert any document to an eBook. You might find it convenient to perform various commands in Atlantis through the keyboard. For this most commands in Atlantis can be associated with a hot key. Pressing an associated hot key allows to execute the corresponding command. You must select the relevant Category on the left first, then browse the Commands list on the right and select the target command. When the desired command is selected, the Assigned hot keys box displays the hot keys currently associated with it. 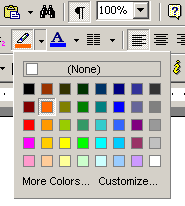 "(None)" is displayed in this box when the selected command has not been assigned a hot key. click inside the New hot key entry box, then press the desired hot key on the keyboard. A warning message will pop up if the chosen hot key is already assigned to a different command. or press the ... (3 dots) button next to the New hot key entry box. You can then choose any appropriate hot key from a list of the currently unused hot keys. Note that in both cases, it is necessary to press the Assign button to save your choice of a (new) hot key. Also if needed, you can assign multiple hot keys to the same command. To remove an already assigned hot key, click it in the Assigned hot keys box, then click the Remove button. 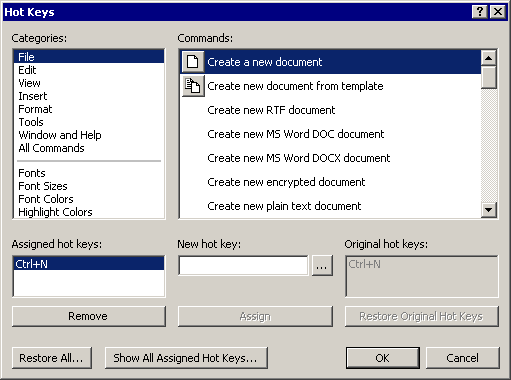 The Original hot keys box displays the default Atlantis hot keys for the selected command. After changing hot keys for a command, you can always revert to the original hot keys for this command by clicking the Restore Original Hot Keys button. The original default Atlantis hot keys for all commands are restored by pressing the Restore All button. Finally release the Ctrl and Shift keys. Hot keys can only be assigned to the font sizes listed in the Tools | Options... > General > Font Sizes... dialog. So if you want to assign a hot key to a font size not yet included in the Font Sizes dialog, you must add that font size to the Font Sizes dialog first. The various menus of Atlantis and the toolbar hints include information about the hot keys associated with the corresponding menu items or toolbar buttons.